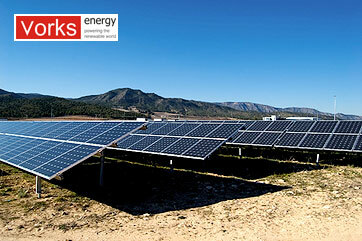 We at Vorks Energy ensure that the power plant makes the most of available land and Sun to set the new standard for high-performance utility-scale solar power. We begin with first doing the preliminary assessment of your energy requirements and assist you in determining the solar production with respect to project site/location and generation capacity. Also discussed at this stage is the technology vis-à-vis cost analysis. So things like module efficiency and its price trends. 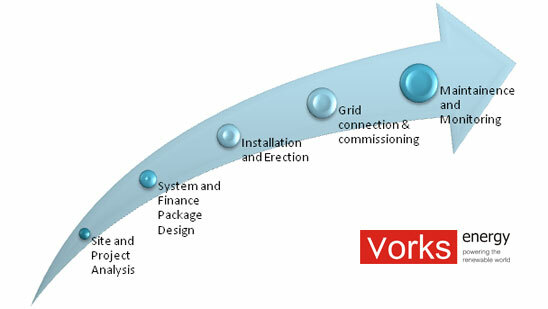 As each site has individual requirements, Vorks will develop a bespoke package, taking into account - the location and insolation levels and respective limiting factors such as policies, PPA/Feed-in-tariffs. We also look into the results of successful commercial projects at various locations. Thus we arrive at returns on the investment. Once Site and project analysis is done, next step involves in designing of the system along with the submission of Financials. This step involves finalization of other aspects of the project like invertors, transformers, mounting structures etc. We ensure that best of the quality materials are used in order to ensure maximum generation within the available financial parameters. Our installation and erection staff manages the entire installation and erection of the plant, including the logistics, system integration, civil work and if required, the power evacuation infrastructure set-up. Once the final installation and erection is complete, the GRID connection is done and the plant is commissioned. The integral part of any completed installation is the periodic checks for the Solar PV system so that any problems if encountered can be found and corrected before they affect system operation. Since the Solar PV technology is very stable, regular maintenance is limited to cleaning of PV arrays by water every week in case of dusty environment, and day to day, month to month simple monitoring of amount of power generated vis-à-vis projected via computer attached.